No SCADA no automation could be an axiom (saying / proverb) since SCADA is indispensable in any automation based technology. All Industries need trained engineers in SCADA based designing, since they need to handle automation equipment having SCADA designing incorporated in them.. SCADA Training for the engineers is therefore indispensible. SCADA has been there ever since automation made its first appearance; such is its importance in automation technology. Initial SCADA systems included mechanical and human-supported operations for data acquisition, but with the advancement in the field of electronics and Information Technology, SCADA got transformed into a more sophisticated system shedding its dependence on humans and mechanical gadgets. SCADA Training enables the engineers to embrace the job opportunities with relative ease. Today SCADA is an advanced system in the mainstream automation. Entire plant operations could be monitored and controlled if SCADA is interfaced with PLC & DCS (distributed control system), since SCADA effectively results in reduction of Time, Man power and Costs simultaneously increasing Safety & Production. High level flexibility in control and Safety in large industries can be comfortably attained using SCADA system. 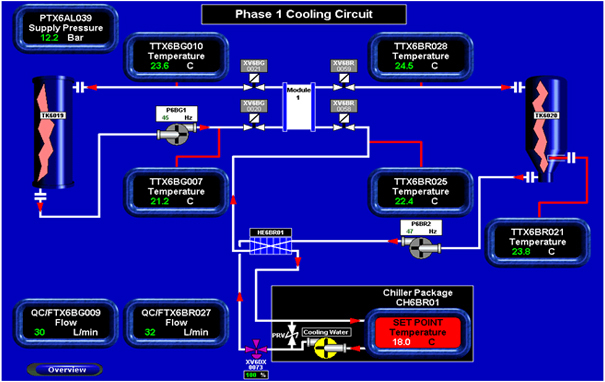 With the SCADA system set in industries the automation processes could be monitored and controlled easily with the use of mouse on the computer screen. There are two types of SCADA Software one which is Proprietary and the other Open. Companies develop their own proprietary software to communicate to their hardware of the total system they offer as a turn-key solution. Open software systems are equally popular due to their Inter-operability. One getting advanced SCADA Training in automation should have got thorough training in SCADA system. Wiztech provides SCADA training focused on all major SCADA-based-designs’. The SCADA Training is not complete without SCADA interface with PLC using the different communication protocols which trigger the student into designing and implementing of the industrial automated process. Since SCADA changes the automation process monitoring and controlling the knowledge and skills in SCADA is vital for an automation Engineer. SCADA Training is therefore indispensible. At Wiztech the trainee-candidates are exposed to “industrial real time SCADA projects”, which are included in SCADA training. Wiztech, that way provides the best SCADA training in Chennai, India. Wiztech keeps you updated with the softwares pertaining to TEN major brands. Though there are several other brands in market. The population of the SCADA system incorporated automation projects are the maximum and fall in these 10 brand varieties. The students will be more than adequately equipped if they are thorough with all the concepts and practical aspects of these brands. Communications – within the system related components is something the students should study in depth when pursuing Industrial Automation. Allen Bradley/ Rockwell Communication products are popular for their applicability and quality effectiveness. Students having knowledge based familiarization in the applicability and utility aspects of Allan Bradley / Rockwell Communication products and the software would attain the required level of competence in the field. There are different types of communication options when Allen Bradley controllers are used in the system. Wiztech provides adequate theoretical and practical knowledge so that their performance network development projects will be good and dependable for future. A maintenance course or a Higher one is essential to investigate the program and hardware for trouble-shooting. The highlights of Wiztech Automation training & why you should join Wiztech Automation for PLC AND SCADA training. IAO – International certification – The Accreditation that Industrial Automation Training organizations crave for. Free Accommodation – You will be at home when you are really not..